I must admit I half CASED this idea from the very talented Vicky Hayes from the UK, in as much as it was her idea to punch the word window and stamp the sentiment in the negative space left by the punch. I cut the Pacific Point cardstock so it was just a fit for the Tulip embossing folder, I then punched the strip for the sentiment using the word window punch and making the top of the punch just level to 2 1/2 tulips up the side. The sentiment from Teeny Tiny Sentiments was stamped into the negative space. 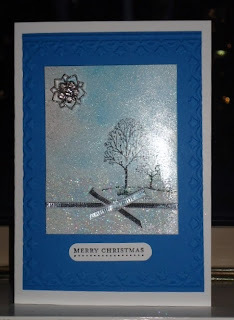 I then took Glossy White card stock and very lightly sponged the whole card with Champagne Glimmer Paint, I thin over sponged most of the area with Pacific Point Classic Stamping Pad. Them image was stamped using Black Stazon, and then I swiped the Versamark ink Pad over the bottom of the card stock, sprinkled Heat and Stick Powder to it, melted it then sprinkled Dazzling Diamonds and heat set it once again. I think it gives a lovely snowy icy effect, dont you? I tied some 1/8" Silver Ribbon around the card and tied a nice bow in the centre. I absolutely adore the Frosted finishes Embellishments and added one to the top left hand side of the card for that little bit of extra bling. It looks so much "blingier" (is that even a word) in real life and I think the ladies are going to love making this card. Till next time, happy stamping! Stunning card. Love it, especially the "snow. Love, love, love it Gwen!